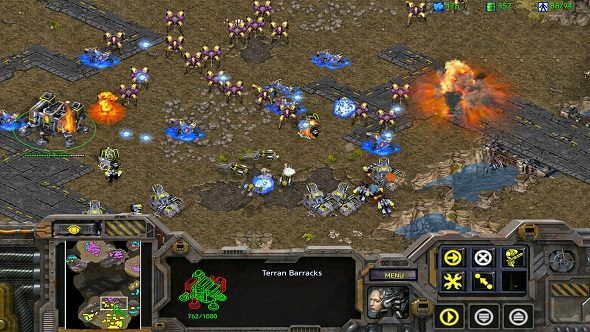 With StarCraft Remastered coming this summer, Blizzard have released a special design retrospective about the creation of StarCraft. Talking to many of the designers, artists and programmers who worked on the landmark RTS, this retrospective reveals just chaotic the development process was. If you’re looking for blasts from the past, check out these great retro PC games. According to the retrospective, the original planning process for StarCraft was more like “a bar brawl” than anything else. Rather than having a meticulously planned design schedule, development “was more of a process of—let’s put this in and boom,” says Blizzard artist Samwise Didier on drafting the artwork for StarCraft’s units. While haphazard, the design process was definitive, with the team refusing to change a unit’s design once they had decided on the initial concept. “There was no going back” says Didier and using this method, the team eventually came to the now-famous designs for the Terran, the Protoss and the Zerg. For something like the Terran Battlecruiser, Didier remembers simply “taking squares and rectangles and smashing them together, because it didn’t have to be precise.” Everything seemed to be born out of this creative chaos, with the team finding their way by throwing “a bunch of crap at the wall and [seeing] what stuck around.” It certainly worked, with many of the original StarCraft units becoming iconic in their own right. The development team were also driven by technical limitations, as the lack of colour and expectation to convert to 3D graphics forced the art department to experiment. Rather than trying to be photorealistic, the art team decided to “make models wider and thicker,” resulting in that bulky, over-the-top style that is now synonymous with StarCraft. According to Didier, “the ‘Blizzard Style’ was inspired by a technical necessity”, as the team were tasked in translating their vision of this fantastical sci-fi universe with limited resources. For example, artists only had 15 colours to work with, pushing them to be creative when thinking up memorbable colour schemes for each unit. If you are an old-school StarCraft fan or are just interested in the process of game development, the whole retrospective is worth a read. It’s chock full of anecdotes from other Blizzard veterans, discussing how the studio got its name, their reaction to StarCraft becoming an esports phenomenon and how its economy system was one of the last things to be added to the game.